About this object Langdon Cheves of South Carolina served as Speaker during the second session of the 13th Congress. The War of 1812 ruined the country’s finances and forced the 13th Congress (1813–1815) to authorize new loans to keep fighting. The U.S. military struggled on the battlefield and British forces burned Washington in August 1814, retaliating for the burning of York, Canada. 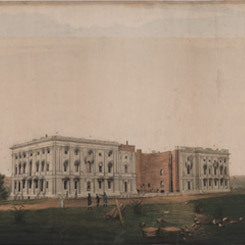 Congress met near the smoldering Capitol, voting to remain in Washington and to rebuild the Library of Congress by purchasing former President Thomas Jefferson’s library. 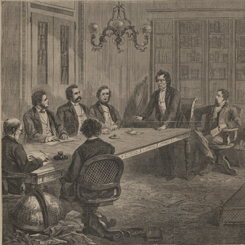 Henry Clay temporarily left the speakership to help negotiate the Treaty of Ghent, which ended the war and squelched a growing secession movement in New England. On this date, Representative John George Jackson of Virginia introduced a measure to create the Committee on the Judiciary. In the most devastating blow suffered by the U.S. during the War of 1812, British forces overran the capital city on this date setting fire to most major public buildings, including the U.S. Capitol. 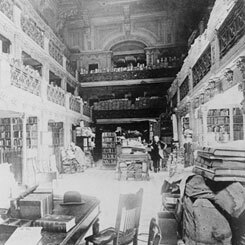 A joint resolution to purchase Thomas Jefferson’s library for the new Library of Congress was introduced in the House of Representatives. 1Resigned from the House of Representatives, January 19, 1814.